This opens the way for implementation of the WTO trade facilitation deal. Paving the way for implementation of trade facilitation pacts at WTO, India and US have resolved an impasse over food security related issues while safeguarding interest of Indian farmers. With the US agreeing to support India's proposal on public stockpiling of food, it would now go for ratification by the WTO General Council to facilitate signing of Trade Facilitation Agreement that has been stalled for months. Announcing the breakthrough, Commerce and Industry Minister Nirmala Sitharaman said that India and the US have successfully resolved their differences on the public stockholding issue for food security purposes in WTO. This will "pave the way for spurring the WTO to more such success," she said, while expressing confidence that members would "take the matter forward in WTO in a constructive spirit". "India has never obstructed trade facilitation... We were only trying to safeguard our farmer's interests," she added. "WTO General Council will receive India's proposal and US will support us," Sitharaman said, while adding that there was a greater understanding of India's position after Prime Minister Narendra Modi's visit to the US. "India is a strong supporter of the multilateral trading system and we are committed to strengthen it. "Bali agreement was not perfect. We had raised these issues for a course correction. . . We have raised our issues... We are happy to say our differences have been resolved," she said in a series of tweets. "India is a strong supporter of the multilateral trading system and is committed to strengthening it and ensuring that the WTO remains a key pillar of the global economic edifice. "The WTO is in the best interest of developing countries, especially the poorest and most marginalised ones among them, and we are determined to work to strengthen this institution," Sitharaman said in a statement. She also said that "plurilateral trading arrangements among a few cannot substitute the multilateral system and are also against the spirit of the fundamental WTO principles of transparency and inclusiveness". There have been suggestions from some WTO members recently that the trade pacts can go ahead plurilaterally if there are differences between a few members. India had made it clear that it would not ratify the TFA, a pact that eases global custom norms, until a permanent solution was found on the food subsidy issue. India had asked WTO to amend the norms for calculating agri subsidies so that the country could continue to procure foodgrain from farmers at minimum support price and sell them to poor at cheaper rates without violating the WTO norms. However, the quantum of subsidy is computed after taking into consideration prices that prevailed two decades ago. There are apprehensions that once India would fully implement its food security programme it may breach the cap. With the issue having been resolved, Sitharaman said: "We supported the Bali Package but when subsequent developments belied that hope, India had no option but to seek a course correction. "India, therefore, took the stand that till there was an assurance of our concerns being addressed, it would be difficult to join the consensus on the Protocol of Amendment for the Trade Facilitation Agreement," she added. "We are extremely happy that India and the US have successfully resolved their differences relating to the issue of public stockholding for food security purposes in the WTO in a manner that addresses our concerns. "This will end the impasse at the WTO and also open the way for implementation of the Trade Facilitation Agreement. "We are confident that the membership will take the matter forward in the WTO in a constructive spirit. 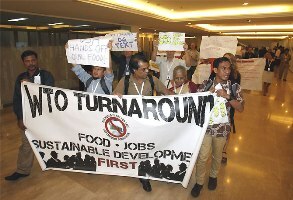 "This would be an important contribution by the WTO reflecting its commitment to development. "We urge the WTO membership to take this forward in the General Council on behalf of the Ministerial Conference and pave the way to spurring the WTO to more such successes," the Minister added.